PITTSBURGH, PA--(Marketwired - February 16, 2016) - Petrosoft, an end-to-end retail automation company announces its strategic partnership with CipherLab USA, an automatic identification and data capture/collection technology company. This partnership expands CipherLab's distribution channel and market presence by leveraging Petrosoft's end-to-end retail solutions as well as its sales, support, training and marketing expertise. 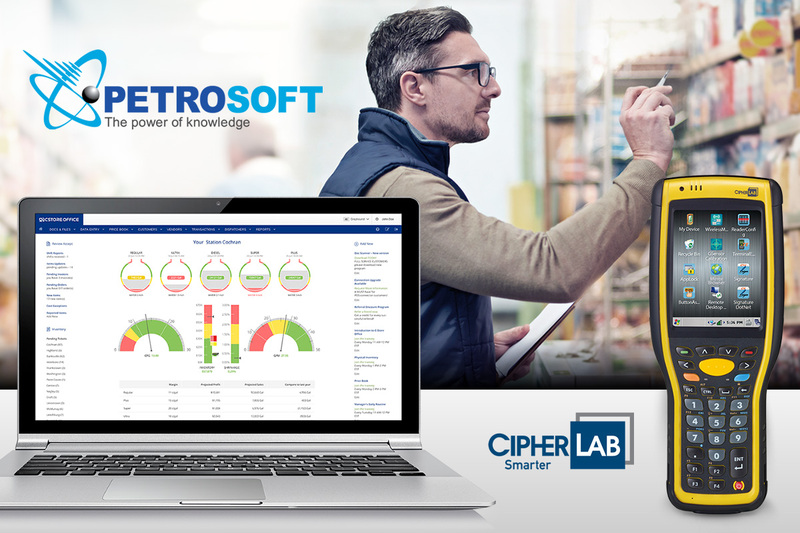 The addition of CipherLab to Petrosoft's product catalog enables the company to enhance its product offering with a trusted inventory scanning solution that integrates with its cloud-based back-office solution, C-Store Office. With industry analysts reporting US shrink rates of as much as 2% of retail sales and an average of 8% in terms of out-of-stocks, technology enables retailers to control these operational risks which can make or break an operation. This partnership highlights the importance of data capture, exchange and integration with the retail platforms that fuel today's retail ecosystem. "Our strategic partnership with CipherLab is a reflection of the proven value it delivers to our customers," said Sergey Gorlov, President and CEO of Petrosoft. "Although Petrosoft integrates with the industry's leading inventory scanning technologies, the CipherLab 9700 is the only inventory scanner included in Petrosoft's product catalog. Our decision to add CipherLab to the company's POS, made-to-order, back-office and fuel management technology is based on the company's product reputation, value and ease of integration with C-Store Office, Petrosoft's back-office solution." "We are excited to have Petrosoft as a Strategic Partner," says Luis Wu, Vice President and General Manager of CipherLab USA. "Using Petrosoft's retail solutions with the CipherLab model 9700 mobile barcode scanner, in-store operations are a snap to perform. Convenience stores, gas stations, and liquor stores can now easily track inventory, receive deliveries, place orders, and perform price checks using this total solution offered by Petrosoft. Retailers will realize great value with Petrosoft's retail solutions and CipherLab hardware." Petrosoft transformed the convenience store industry when its founder, a retail operator and engineer, introduced C-Store Office, its cloud-based back-office software solution in 2002. Today, the company designs, develops, and markets end-to-end retail technology, enabling a seamless connection between vendors, forecourt, point-of-sale, made-to-order, back-office, fuel management, network and financial systems. The company continually strives to find innovative ways to enable retail operators to better manage their forecourt, in-store and back-office operations, decreasing risk while optimizing inventory, productivity, sales, profits and margins. The company supports its product line from its headquarters in Pittsburgh, PA and offers services along with a full-menu of training options including on-site, classroom, online and on-demand sessions. Find out more at http://www.petrosoftinc.com. CipherLab is a global leader in the design, manufacture, and marketing of Automatic Identification and Data Capture/Collection products and systems. The company's mobile computers and scanners are integrated into the networks of some of the world's best known logistics, retail, distribution, government installations, and healthcare companies, helping them run more efficiently and effectively onsite and on the road. CipherLab USA is headquartered in Plano, TX. For more information, please visit www.cipherlab.com or like us at www.facebook.com/CipherlabUsa. Petrosoft, an end-to-end retail automation company, has partnered with CipherLab USA, an automatic identification and data capture/collection technology company. The partnership between this trusted inventory scanning solutions provider and Petrosoft's cloud-based back-office solution, C-Store Office, enables retailers to control inventory risks such as shrinkage and out-of-stocks. C-Store Office is a cloud-based back-office software solution for retailers including gas stations, convenience stores and specialty retailers. The online tools help optimize store inventory, manage costs, control pricing and enhance in-store and forecourt operations to maintain better control over both fuel and store margins. Deliberately created for the challenging requirements of the warehousing, distribution centers and manufacturing industries, the CipherLab 9700 series features excellent functionality and ruggedness for applications within four-wall environments. User-friendly software and utility support also provides new and updated benefits to increase user output.